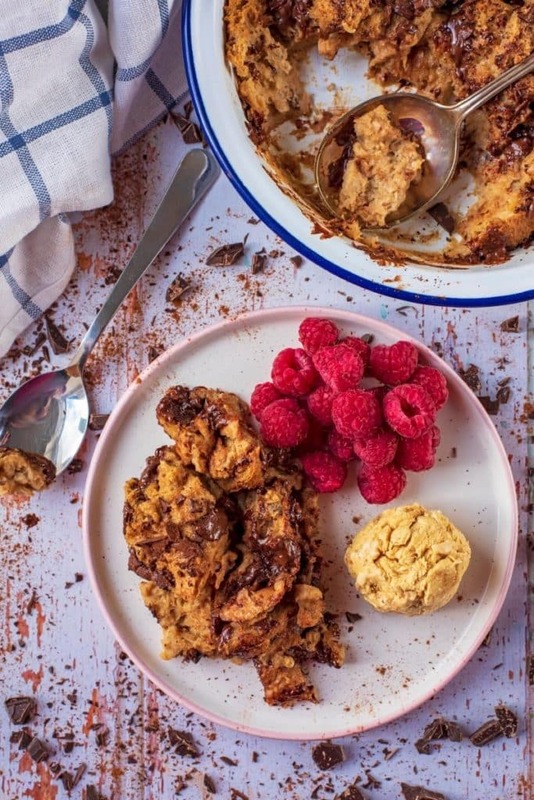 We took a classic bread pudding and put a lighter spin on it by sweetening it with just a little honey, using brown seeded bread and then we added some dark chocolate chunks. Because, why not! 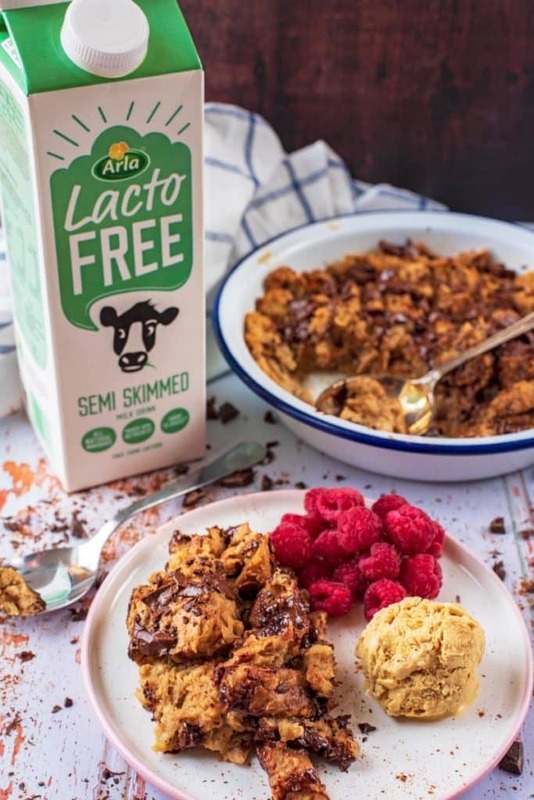 This Chocolate Bread Pudding is total comfort food and great if you can’t have lactose as we used Arla Lactofree to celebrate it now being stocked in Costa Coffee shops. 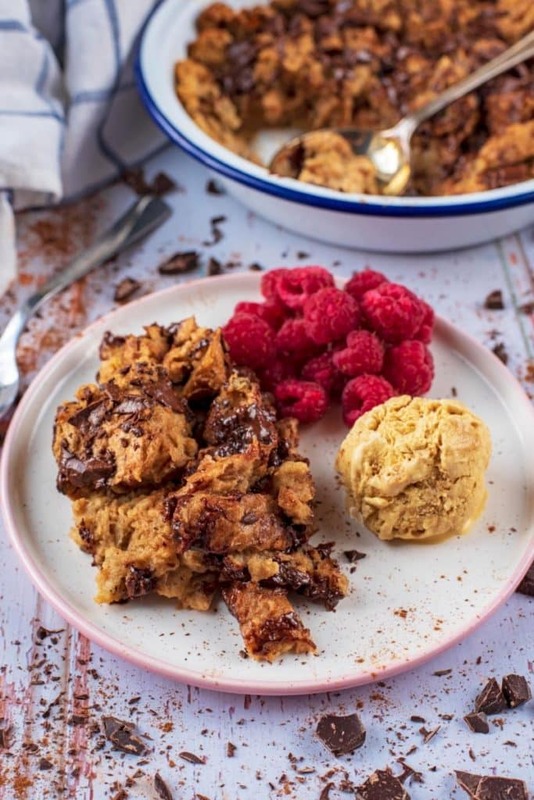 Bread pudding is one of those classic school desserts that always brings back happy memories of eating it in the canteen full of hundreds of rowdy and sugar high kids. Nowadays, it is one of our favourite ways to reduce food waste as the bulk of the dish is bread. Got some bread that has gone a bit stale? It’s screaming to be turned in to a chocolate bread pudding. Bread pudding is basically the combination of torn up leftover bread, milk, eggs and a sweetener. All soaked up together and then baked in the oven until gooey and crispy. Kind of like a sweet casserole. But there is so much more you can do with it and lots of ways to customise it. What does it taste like? It’s kind of got the gooeyness of brownies, but the flavour of French toast and it’s pretty dense. Then it takes on the flavour of whatever else you have added in to it. It’s a classic British dessert and in the 13th century is was known as a poor man’s pudding, because of the basic ingredients that it uses. Basic doesn’t have to be boring and if you want comforting dessert that the whole family will love, then this is it. We have also made it using Arla Lactofree Milk, so everyone can enjoy a big spoonful of this. I have quite a few friends that are lactose free, and they always rave about Arla Lactofree Milk. Not only because of the taste, quality and value, but because it is so readily available too. So, when I have them over for dinner I make sure to use it in the dessert I make or the sauce to go with dinner. Arla Lactofree has all the nutritional benefits and taste of standard milk, just without the lactose. It is made from all natural ingredients – they simply filter milk and break down 100% of the lactose so everyone can enjoy some simple, nutritious goodness. Available in skimmed, semi skimmed, whole and chocolate. 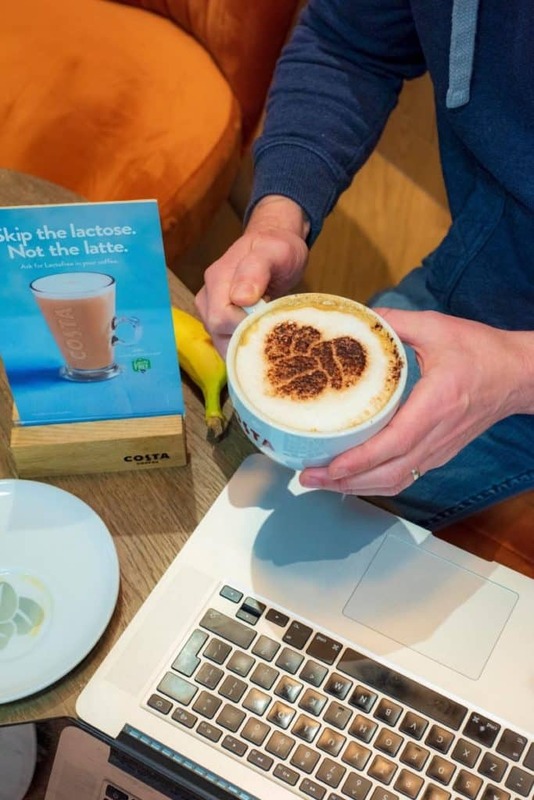 Great news for people who are lactose intolerant – Arla Lactofree is now available in Costa Coffee shops. Wooo hooo! I remember when the only “alternative” milk available in a coffee shop used to be soya milk – so it’s great that there are so many alternatives now. 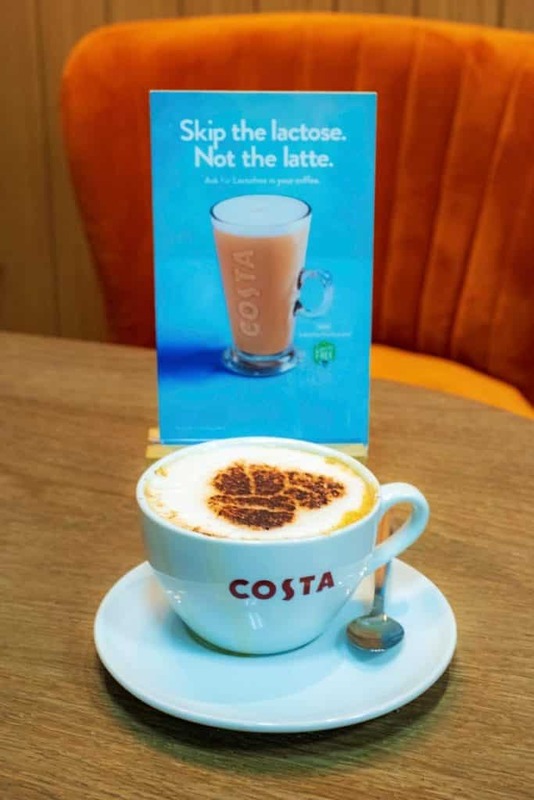 You can now enjoy all of your favourite Costa drinks with Arla Lactofree Milk. We head to our local Costa once a week (as it’s in our nearest supermarket) to do some work planning and we have been trying it in a few different drinks. You honestly can’t taste the difference, which is great news from lactose intolerant people. 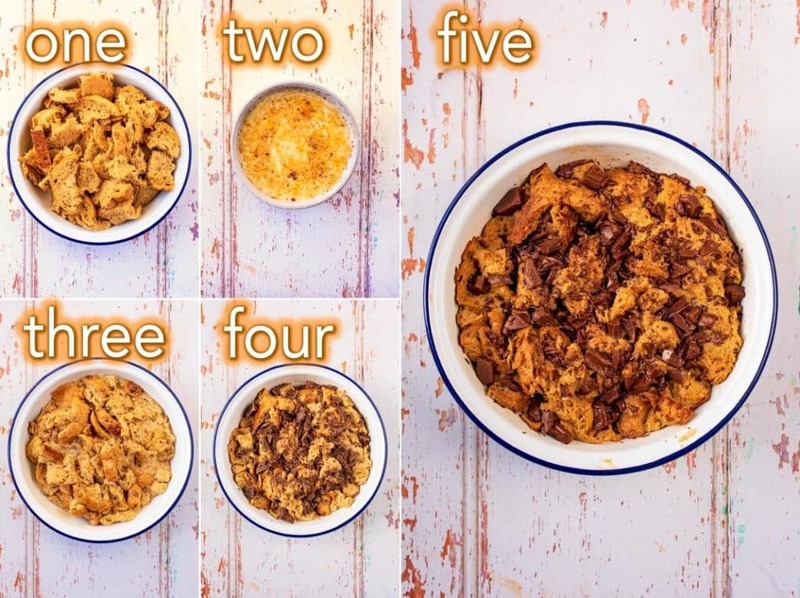 So, to celebrate the milk being available in Costa, we made this bread pudding recipe that uses it. The great thing about this is you can use pretty much any bread – which is why it’s so good for using up stale bread. We had some wholemeal seeded bread that needed using, so we tore that up to mix in. You can use regular white bread or you can even use croissants if you want to make it a little more indulgent. What Else Can You Add To Bread Pudding? We have made this so many times over the year and I don’t think we have made it the same way twice. Use this as a base recipe and then go crazy with the add-ons. You can mix in some chopped nuts (we like pecans) and dried fruit (cranberries or cherries go well with the chocolate). If you want a flavoured bread pudding, then orange or mint go well with chocolate. You can use orange or mint extract or swap a little of the milk for some orange juice and then grate some fresh orange zest on top when you sprinkle the chocolate. You can serve it as it is, but if you want to make it more of an indulgent dessert, then serve it with some ice cream or frozen yoghurt. A little drizzle of caramel sauce is a good addition too. Yes, and there is some preparation that goes in to this dish that would suit it being made in advance. Once you have added the liquid to the bread, it then needs to go in the fridge for at least an hour so that the bread can soak everything up. But, you could leave it in the fridge for 4-5 hours and then put it in the oven 40 minutes before you are ready to eat it. Can You Reheat Bread Pudding? This will keep in the fridge for up to 3 days and then you can either eat it cold, at room temperature or heat it up in the oven. I do find that the texture changes when it reheats, so it’s best eaten straight after cooking – you can always change the portion sizes if needed. One: Tear the bread and put it in to a baking dish. Two: In a bowl, whisk together the milk, egg, honey, vanilla and cinnamon. Three: Pour the milk mixture over the bread and make sure everything is covered. Put in the fridge for at least an hour. Four: Take out of the fridge and sprinkle the chocolate chunks on top. Five: Put in a preheated oven at 200C for 40 minutes. 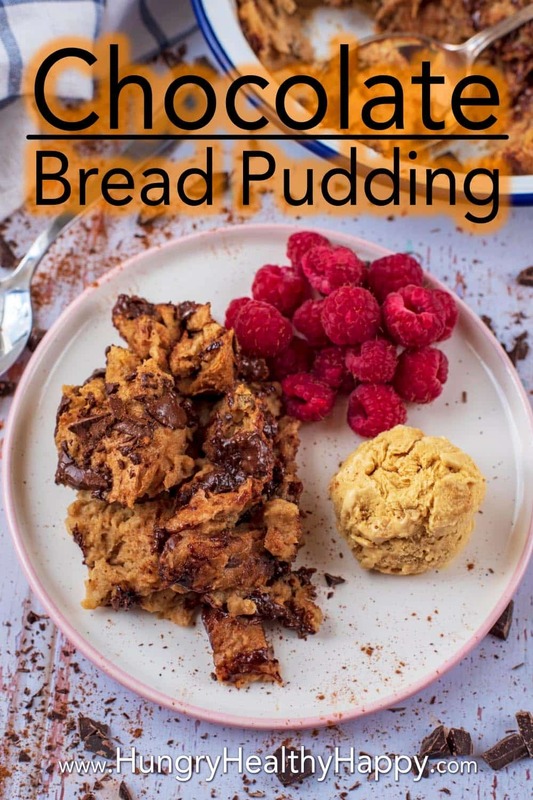 This post was originally published on 21st October 2013 and updated on 14th March 2019.
what a great way to use up some left over bread! I love the chocolate in this recipe, can’t wait to try it! We loveeee bread pudding in our house. Especially with chocolate. I absolutely love how your recipe sounds. Have to give it a try. This is going on my list to try next week. I enjoy bread pudding but adding chocolate is a great idea makes it even better, I need to make your recipe soon have many of teh ingredients at home. This recipe is a great excuse to use up an old loaf of bread. I’m always looking for ways to make a yummy dessert! Thanks for sharing! 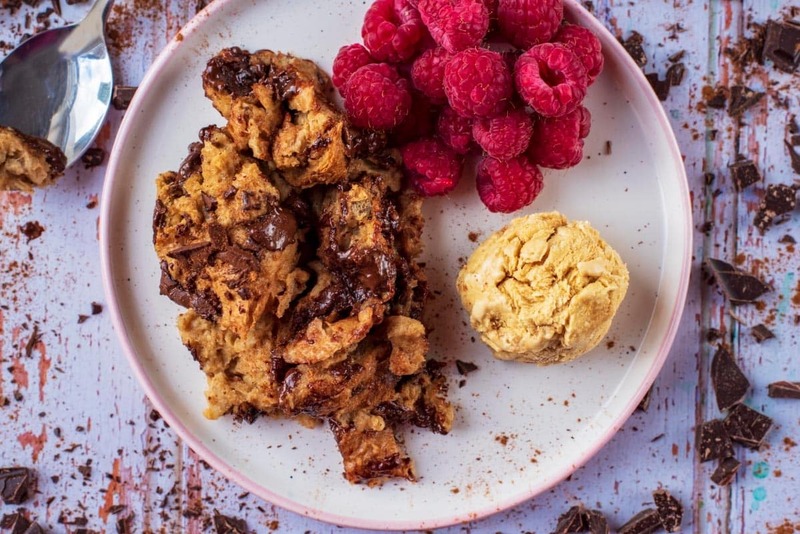 I love bread pudding…the addition of chocolate makes it that much better! I was looking for this recipe from such a long time. Thankfully I found it, lovely instructions. I would be making it asap & share the experience with ya. Beautiful recipe! Looks a a great breakfast for the winter! I have been thinking of making bread pudding but up until now had never thought of making it with chocolate! What a great idea and I bet my family would adore this recipe. I will touch base and let you know how it goes over. i’m not a huge bread pudding person, but you add chocolate like this and i immediately become one. this sounds awesome!! Love that this is a great way to use up leftover stale bread! It is great that it is so low in fat too. This sounds like my ideal dessert. Can’t wait to try it. 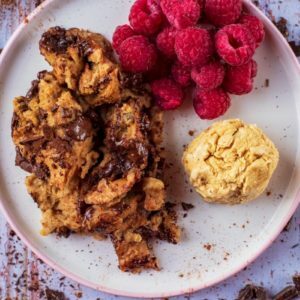 Would this work with carob chips instead of chocolate chips? Yes, no reason why not! healthy chocolate dessert? Yes please! I am definitely making this at the weekend. Yum. I used to love bread pudding as a kid. I can’t wait to make this for my family.